Don't mistake Kinectimals for a Nintendogs clone. This is the closest the Kinect launch has to a traditional video game, one that eight year old girls are going to coo at. Kinectimals is both a virtual pet game featuring cute, fuzzy young wild cats and a quest to unlock the mysteries of an island. It's also a Kinect launch game that uses many of the new sensor's tricks. Kids who might find a tiger cub adorable and be entranced simply by the option to air-pet them from their living room; also, surprisingly any traditional gamers looking for a Kinect adventure that feels just a little bit like World of Warcraft. Oh, and my cat. My cat can't stop staring at this game. Kinectimals is the real deal. It's a motion game that has many hours of unlocking gameplay content. It's a motion game that looks great in high-definition. And it's a motion game that uses a lot of the Kinect tricks, making this an unusually polished launch effort. This is mostly a game for young girls, right? The first time Microsoft showed Kinectimals, a little girl was playing it on a stage in front of hundreds of reporters and gaming executives. She was calling her virtual tiger cub by the name she gave it, reaching toward her TV to scrub behind its ears. The cub purred. She gestured for it to do tricks and it responded. That's all real and in the launch game. You're interacting with a virtual pet, albeit one that can't die and doesn't mind if you ignore it for a while. That part's probably mostly for young girls, but that's not the whole game. So there's a traditional video game hiding in here? There is. Kinectimals is a minor mystery game. You're on an island with your pet cub, a panther, in my case, and you've got a flying lemur buddy who tells you about a lost treasure and shows you a mostly incomplete map. If you're playing the game to advance, you'll be spending more than six hours trying to fill experience point bars with points you earn by playing games with your pet. You compete in challenges to unlock new toys, which unlock new games. In other words, you always have a new quest, a new goal. I found it hard to stop playing when I knew that just a few more points would unlock the next challenge or map area. OK, there's a game in here, but could anyone over eight really have fun with this? You could, if you like sports-style mini-games. Don't think of Kinectimals as a game about caring for a panther cub but as a game about tossing balls at targets, hurling Frisbees through hoops, volleying a volleyball back and forth (with a panther). The Kinectimal that purrs in front of you is essentially an excuse for the game to give you access to a wide variety of simple toys and mini-games. Take out a jump rope or a radio-controlled car and not only will your cub get excited but your Xbox will start spitting challenges at you that can help you earn points. Toss the ball through these hoops that just popped out of the ground, for example. You're a cat person. You just like this for the cats. Not true. I do have a cat. My cat is entranced by this game. But I was not entranced by my panther. I seldom used voice commands and didn't even pet it or clean it that often, just when it was too muddy and asked me to. I never felt a strong attachment to my virtual pet animal. It's there and cool to look at — and it is sweet that it sometimes runs in and knocks over a domino or steps on a mushroom that you keep missing during a mini-game — but I think of Kinectimals as a Kinect motion-game compilation. That's what I like it for. If it's a mini-game collection, you're saying it's a good one? It's a decent one. It works and works consistently. It uses the Kinect sensor for head-tracking, letting you lean to the side and get a different view of the scene. It uses voice and gesture control well, the latter to both make your pet pose but also to enable natural real-life gestures for tossing a virtual ball and swinging a virtual butterfly net. This game helps prove how capable Kinect is. Maybe the question is if there's enough for an eight-year-old girl in this then? There is. What kid wouldn't like a game that asks them to lie on the floor, a move that triggers their virtual pet tiger to suddenly stiffen, comically roll its eyes and flop to the side, playing dead. Awwww. 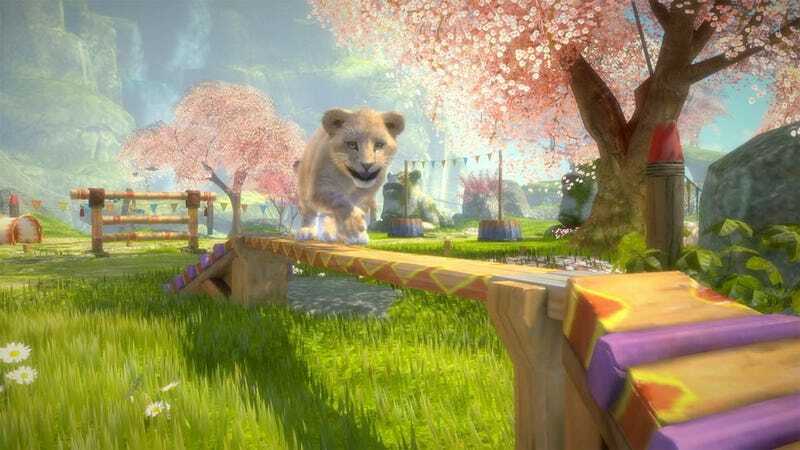 For kids I expect Kinectimals to be an irresistible showpiece that delights them simply by letting them feel like they have a cute tiger cub they can pet by scratching the air in front of their TV. For traditional gamers, Kinectimals is worth a look. There's meat on its bones and a successful abundance of simple but smart Kinect tech tricks. Kinectimals was developed by Frontier Developments and published by Microsoft Game Studios for the Xbox 360, released on November 4. Requires the Kinect sensor. Retails for $49.99. A copy of the game was given to us by the publisher for reviewing purposes. Played through to the last section of Kinectimals' map, enjoying myself thoroughly, though I found the turn-taking multiplayer uninteresting and not a draw. Drove my cat to jealousy. Sorry!